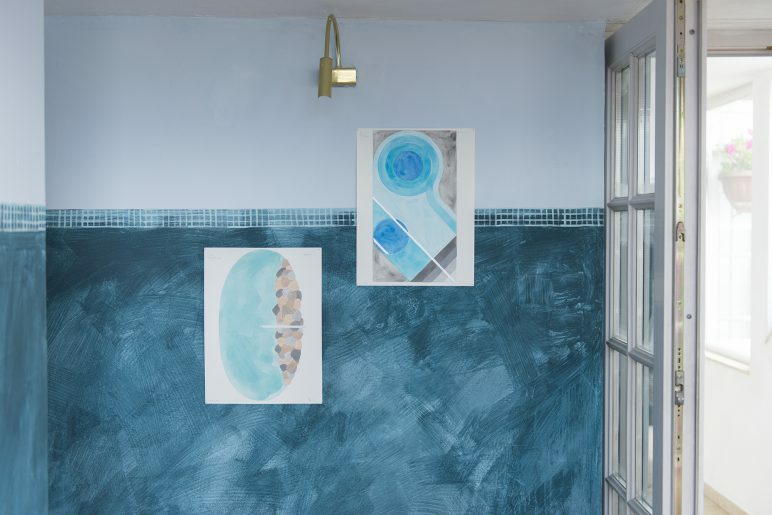 Pool Paintings Part I is both a figurative response to the site-specificity of Swimming Pool project space in Sofia, and an abstract flight of imagination. It began with a conversation, and Navine G. Khan-Dossos’ request to explore the possibility of returning the pool to its former glory: a water-filled hole perched on the rooftop of a building in central Sofia. But as the proposed insurance and engineering costs and permissions mounted up, it became clear that such a large undertaking would remain within the realms of imagination. Instead, Pool Paintings Part I became an open-ended exploration and imagining of all the possible pools that could be constructed on this site. 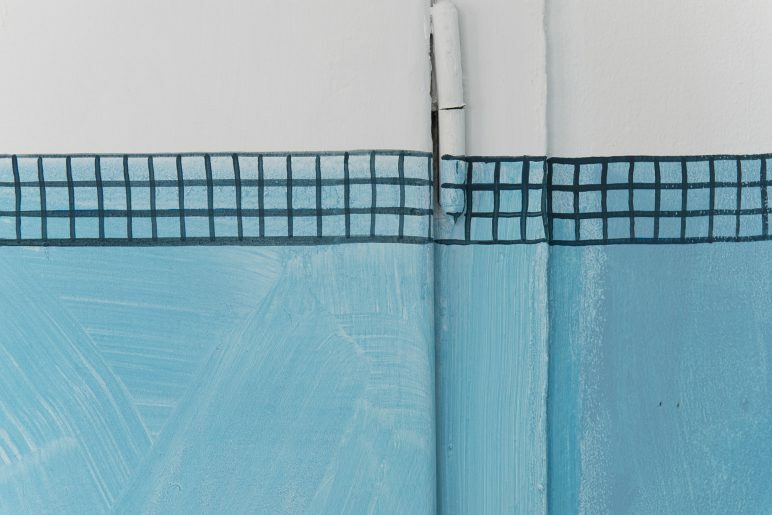 Khan-Dossos uses the ratio of the pool as a constant in all her designs, some of which draw upon geographic specificities of pools’ modelling, while others are more fantastical, exploring notions of society’s love and fear of water. Her plans further play upon topics as different as the chemical composition of spa waters, the four temperaments, or, remembering Ludwig II’s melancholy swan, the refined loneliness of water. Constant throughout the works is a sense of potentiality, made explicit in the title of the show: Part I of a possible series of explorations, rather than an end point. The works open up the complex history of the site itself: conceived in the 1930s, the pool was both a therapeutic adjunct and a setting for cocktail parties of its owners who were publishers of a popular modern woman magazine. Very soon after the building was completed, it was nationalized by the Communist party. All this echoes the pool as a site of leisure and luxury, healing and loss. Various cultural histories also meet in these paintings. The first man-made pools were constructed for military training in the 18th century, and reached their apogee in the gardens of glamorous Hollywood mansions whose owners conversely never entered them, but held parties and photo-shoots around their edges, drawing upon their symbolic power. The brand names of standardised and mass-produced pool designs appropriate the actual names of islands that were once part of colonial territories, even as the colonial powers themselves developed spa culture as a form of prophylactic against the supposed illness and degeneracy of the tropics. 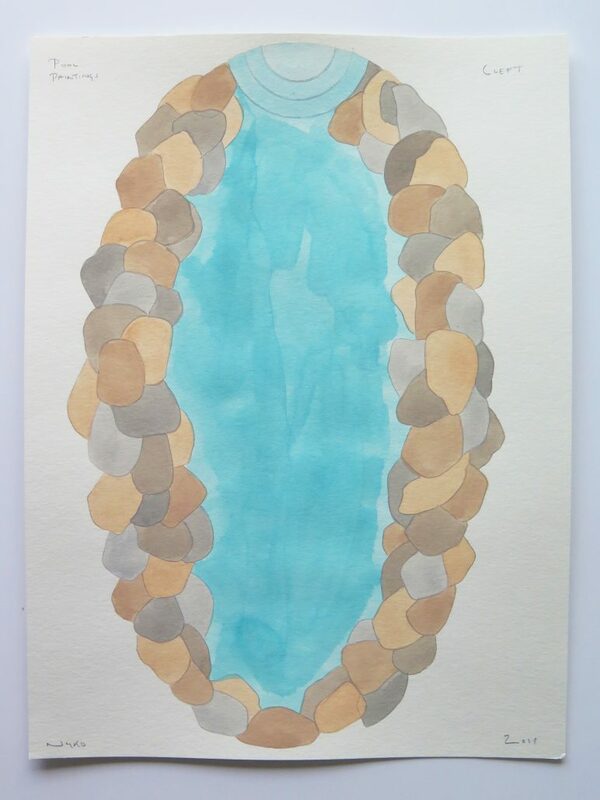 The fantastical possibilities of Swimming Pool’s future represented in Pool Paintings is accompanied by a screening of iconic films associated with the swimming pool, selected by Khan-Dossos, in the pool itself: Robert Altman’s 3 Women (1977) and Frank Perry and Sydney Pollack’s The Swimmer(1968).